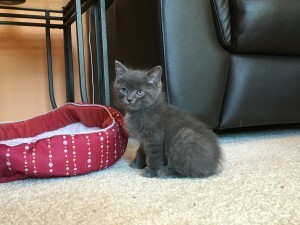 Educated by a Rumpy Cat - Dennis McCarty Little Bear is a "rumpy cat" kitten. He's teaching a Unitarian Universalist family about the 7th Principle. About every six months, my better half, Kate, fosters a litter of kittens from the local animal shelter. It’s a win/win hobby for her. The kittens get food, a warm home, and climatized to humans. We get the pleasure (usually) of their company. The third kitten had no tail at all. I had no idea what you called that. But it turns out, there are different gradations of Manx cat. And contrary to what I had thought, it’s not a breed. Manx syndrome is a mutation: a defect in the gene which controls development of the spinal cord. The past weeks have been an education on these creatures. The tailless variety is called a “rumpy.” Others are “pointers,” “stumpies,” and “stubbies,” depending on the length of tail. Over the years, people have tried to get them to breed true, breeding the short-tailed cats back to each other with results that are often deadly for kittens born of the breeding. The mutation can came with side effects ranging from picturesque, all the way to fatal. Because the mutated gene controls spinal cord development, it can result in difficulty walking, poor control of bladder or bowel, or even forms of paralysis. In the most serious cases, the kitten just dies, or has to be euthanized. Little Bear is right on the borderline. We worried that he wouldn’t be able to walk, but he figured it out. He has a quirky limp. 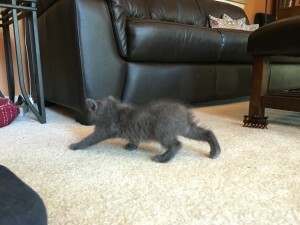 Instead of the standard kitten-gallop, he kind of hops with his back legs as he races after the the other two. He also has a problem with constipation due to decreased bowel function. He’ll require special food and perhaps medication as long as he lives. That may not be long. 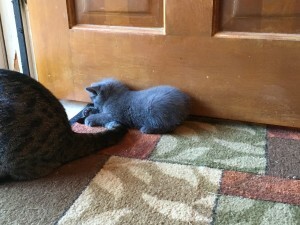 When the kittens reach two pounds’ weight, they and the mother will go back to the animal shelter to be spayed/neutered and put up for adoption. Little Bear? Who knows? Strapped for funds and volunteers, this animal shelter, doesn’t have resources to deal with special needs kittens. Unless Little Bear gets lucky, his fate is likely to be the wrong end of a needle full of pentobarbitol. 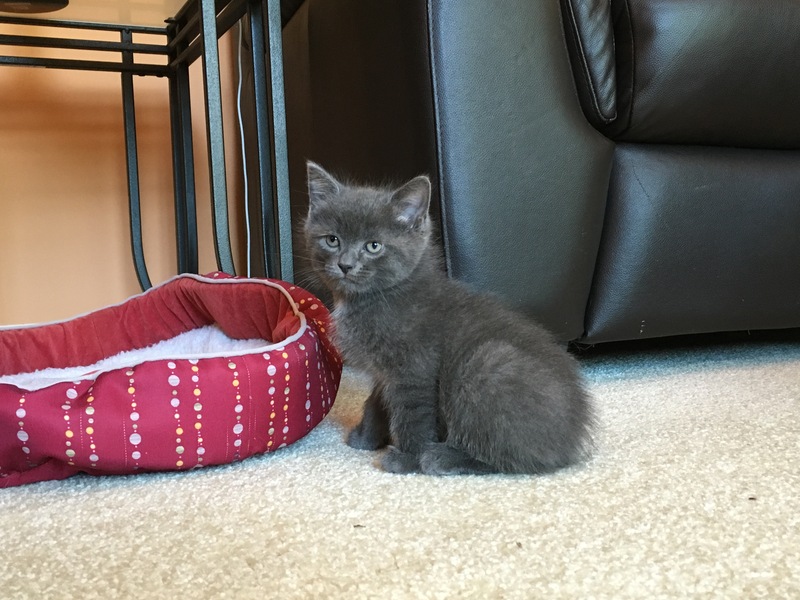 Of course the sad part is, apart from difficulty pooping, Little Bear is as full of spit and vinegar–as eager to play–as any other kitten. There are bigger problems in the world than a kitten who faces execution if he doesn’t get adopted. But Little Bear’s is one problem we humans helped create. Our Unitarian Universalist 7th Principle asks us to “respect the interdependent web of all existence, of which we are all a part.” Where’s Little Bear in that picture, I wonder? Thanx for this thoughtful essay. I have had two Manxes and love them. I was unaware that many were dying early. I will rethink my involvement with them. On the up side – they are wonderful cats – very companionable! I still miss Hermes – my favorite cat ever. I can’t argue on the personality piece, Bruce. All three of these kittens are absolute delights. Assuming nothing further goes wrong with them, they’ll make wonderful pets for some lucky person.